What’s Behind Brunei’s New Military Budget? A closer look at the broader significance of new figures and what they mean for the country’s defense posture. Last week, Brunei’s second defense minister laid out some of the policies and future initiatives of the defense ministry for the fiscal year, including a proposed defense budget increase. The budget allocation reflects an ongoing effort by the Southeast Asian state to increase its defense spending following previous drastic cuts amid wider economic challenges. As I have noted before in these pages, in previous years Brunei’s defense budget had come under growing strain due to broader economic challenges – rooted partly in the fact that the tiny, oil-rich sultanate is highly dependent on the energy sector, and declining energy prices had put pressure on government finances. But after a period of more modest increases and some large double-digit cuts, last year saw an effort to boost defense spending further, with an increase of around 12.9 percent. On March 12, we got a sense of where Brunei is headed with respect to its future defense spending. In discussions during the Legislative Council session that opened in early March, Brunei’s Second Defense Minister Halbi Mohd Yussof presented the policies and future initiatives of the defense ministry for the fiscal year 2019-2020. Per the minister, the defense budget for the defense ministry approved for that fiscal year was around BN$589.87 million (US$436.76 million). The budget amount constitutes an increase of 6 percent from the previous financial year. It also constitutes the second straight year of a defense budget increase, even though the rise this year is much more modest than the double-digit one that we saw last year. Nonetheless, as with the previous hike, this one too ought to be kept in perspective. The figure this year is still far below the BN$719.15 million figure from 2014 before a couple of drastic cuts, notably the major cut of around 25 percent. That was followed by a modest increase and then another drastic 20 percent cut the following year. Plus, the increasing pressures on the defense budget are also not always visible in terms of an observed change in that line item alone, in part due to shifts in other components of the budget and workarounds. Furthermore, there is much continuity in terms of how Brunei is thinking about defense within its wider domestic and foreign policy. Indeed, beyond the new figure itself, much of the policy contours the minister mentioned in his remarks – including the three strategic defense pillars of deterrence and response; defense diplomacy; and holistic defense; and the seven priority areas reflected in the rather unwieldy acronym IKWONDAMAI – were quite familiar. Lastly, as I have emphasized before, a focus on annual defense budget figures should not detract from the wider question: the extent to which Brunei is able to attain its longstanding defense priorities and what trade-offs it needs to make to ensure this occurs, especially in the face of other broader political, economic, and security challenges inherent in the sultanate’s Wawasan 2035 vision. The answers to that question have more to do with individual decisions Brunei makes on its own and with its partners, rather than just a statistic about the rises and falls in its defense budgets. 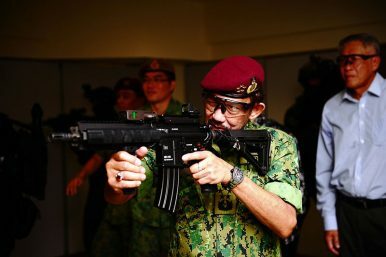 What’s Behind Brunei’s New Defense Budget Hike? The double-digit increase in the country’s budget this year should be kept in perspective.